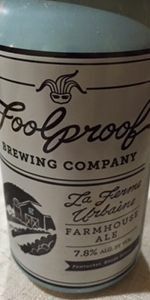 notecard_LFULa Ferme Urbaine (LFU) is our unique take on a farmhouse ale. Influenced by the Belgian saison style, LFU features a complex blend of German hops, pilsener and pale malts, wheat, rye, oats, and spelt. The beer pours a hazy straw color and delivers a spicy, dry finish. So raise a glass and enjoy! One of the tastiest Beligian style ales I've had in a long time... and brewed in Pawtucket! [Original rating 2015-12-30] Draft at Horseshoe Pub, Hudson, MA. Aroma of citrus, straw, bread. Taste is similar, with a hint of spice, black pepper. Dry finish. Really good saison, glad I tried it. Doesn't look great but certainty tastes and feels great. On tap at Cassarino's in Providence (Federal Hill/Little Italy). Not too sour which I liked. Not overwhelming Belgian, a saison/blonde if you will. 12oz can, served in a snifter glass. Pours a darker orange copper body, one finger thick white head, long retention and plenty of lacing. Smell is light caramel, cloves, allspice, a bit of rye, noble hops. Touch of banana bread. Flavour follows, a bit spicy, floral and a bit earthy, caramel, straw, touch of lemon, crackers. Mouthfeel is medium lighter bodied, fairly spicy on the backend, with a moderate noble hop bitterness. Decent farmhouse ale, different than most; the spice is kind of interesting as well. A wonderful Saison. Beautiful unfiltered copper color that produced a decent head which dissipated somewhat quickly. Highly carbonated, light yet slick mouthfeel. Not overly spiced like some. Does a fantastic job of hiding this 7.8% ABV. Very drinkable. Very well may be my beer of choice this summer.